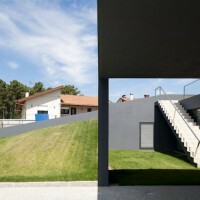 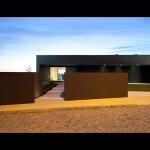 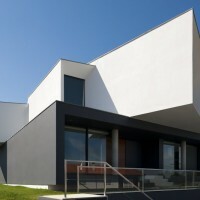 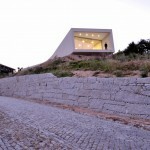 Bruno Armando Gomes Marques have designed the S. Roque House I in the Oliveira de Azeméis Municipality of Portugal. 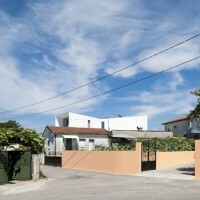 This house is located in Oliveira de Azeméis, specifically in São Roque. 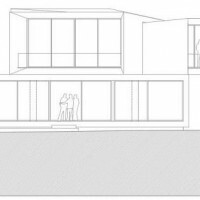 The housing lies between two roads, one to the south and the other to the north, which delimit the allotment and have imposed its location at halfway distance. 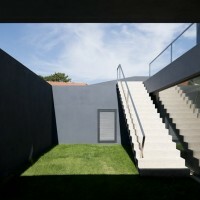 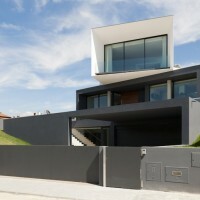 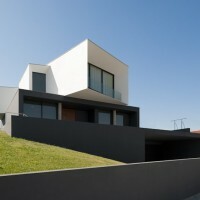 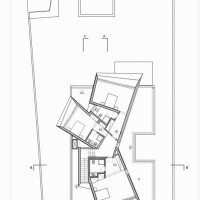 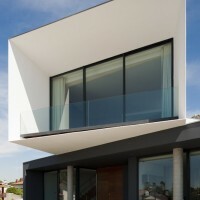 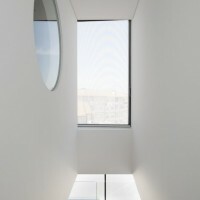 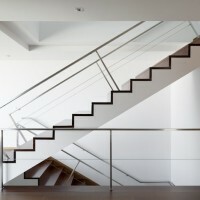 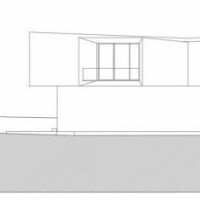 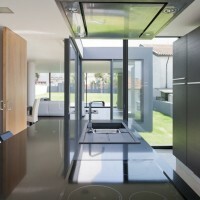 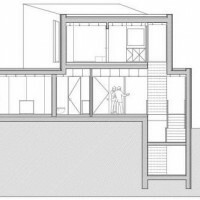 The house consists of two volumes with distinct programs, and a total area of 600m2. 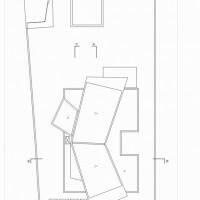 In the volume at level 0, more regular and acting as the base, develops the more social area with the following program: entrance hall, living and dining room, kitchen, service toilet and office with wc. 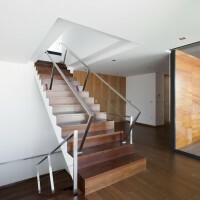 Upstairs, develops a more private area with the bedrooms. 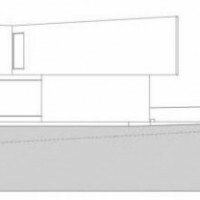 Each bedroom and wc defines the wedge shape of both volumes with different outlooks from each room, in a clearly distinct strategy from the volume at level 0. 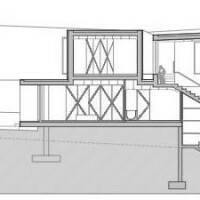 At level -1 are the laundry, storage room and garage. 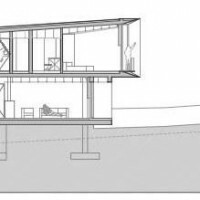 The height difference between the two roads confronting the land allows only two levels for the house, on the south side, while on the north side we added a third level for the garages, with a porch under a green cover. 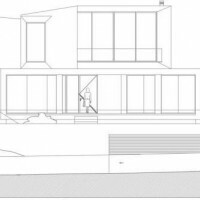 Thus, the program was complete and a solution has been found for mitigating the impact that three floors could impose on the surroundings. 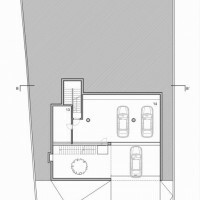 The volume of the living area (living rooms, kitchen and office) has a strict format, gray colored on a green platform, contrasting with the more intimate volume (bedrooms), with a dynamic shape and three wedges white colored, partially overlapping. 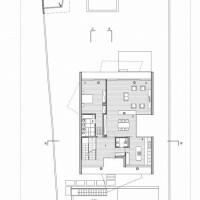 The volume of the garages and porch is partially beneath the house and a green cover, trying to dilute the impact of its size while completing the functional program of the housing.